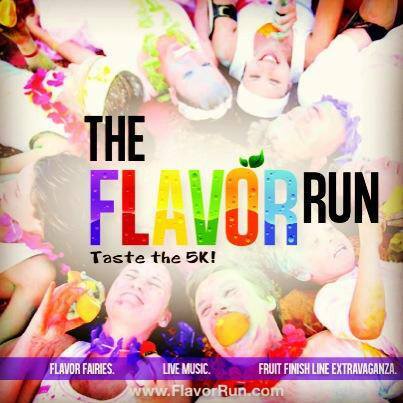 The Flavor Run is coming to Tampa - Taste the 5K and a #giveaway! The Flavor Run is coming to Tampa! On August 17, 2013 join tons of other runners at the Tampa Fairgrounds who are looking for a colorful and delicious fun. There are so many different color runs out there these days but what sets this one apart from others is that the colored powder is fruit flavored! Imagine getting hit with color, yet instead of holding your breathe, you inhale the flavors of various fruits. Note: My contest is over, congrats Meaghan! Not to worry, there are 5 other blogs out there with a chance to win a Flavor Run entry! I will be running this race along with my best friend Keri. We will be official Flavor Fairys, which you can read about below the registration information. Last year, Gabe and I ran the Color Run and had an amazing time and I look forward to this summer 5K. Early registration for the Flavor Run 5K is in full effect until June 12th and you will want to take advantage of this pricing because prices go up in 10 days. Flavor Fairies. The Flavor Fairy program is for anyone who wants to dress up in your best fairy costume and throw Flavor Fairy Dust on runners/participants in the shade of the Flavor Forest. What is the Flavor Forest? Just one of the most awesome features of the Flavor Run. Clocking in at just over a kilometer of running through a shaded area of trees during the run, the Flavor Forest will be a place of fun and excitement. Flavor Fairies will have full access to run around in dresses/tutus/wings/tiaras and sprinkle flavor on all participants. There will only be two waves available, and it is only $5 more than regular registration. If you want to be a Flavor Fairy with me, sign up ASAP! My friends at the Flavor Run have given me one 5K entry to give away! The winner is only responsible for is paying the $3.75 processing fee. Please enter through the rafflecopter widget below and leave a comment in the comment section to be entered into the contest. If you are unsure how to use Rafflecopter, click here for a short video tutorial. Have you ever ran a colored race? I hope they go national after this race! I havent' participated in a Flavor Run before but it looks like fun. Can't wait! I never have, but I'm training for the Disney half marathon! First run ever. That's great Christina. you will love Disney! I will be running the 1/2 too! Good luck Nancy! I am excited for this one too! This will be my 2nd 5k.. Can't wait! That's awesome! This race will be so much fun!! They are SO much fun Katherine! Good luck! I have never run a 5K, and I was hoping to make the Flavour Run my first!! That's awesome! It will be a fun 5K to make your first. 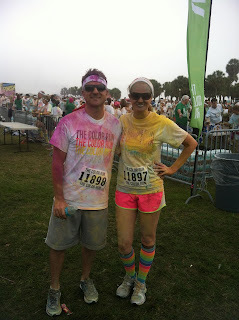 I missed the Color Me Rad in Tampa, but I am going to run it in Gainesville in October. I can't wait! I have run seven 5k's and a 1/2 marathon, but never a color run. The Flavor Run is definitely one I'd like to try! I have never done one before, but am very intrigued by the idea! I typically do the Breast cancer one in October! I ran Color Me Rad a few weeks ago, but this one looks really fun! i have never done a color race before but they look awesome!